Zeus was a Greek god who was sometimes called the “Master of the Universe.” He, and his thunderbolt, showed that he was one of the greatest of all Greek gods. Zeus was also the Greek god of the sky, lightning, thunder, law, order and justice. When Zeus was a baby he was nearly devoured by his father (Cronus, king of the Titans). But why would a father want to devour his child? Most people think that Zeus’ dad wanted to devour his son because he believed that one of his sons would dethrone him, so he wanted to make sure none of them survived. Zeus also had two brothers called Poseidon and Hades. But Zeus’ mother made a change, to protect her baby. Instead of wrapping her child with swaddling clothes, she wrapped a stone with swaddling clothes. Then she hid the baby in a cave guarded by warriors. When Zeus became a man he defeated his father. After that defeat, Cronus’ sons became the Greek gods Zeus, Poseidon and Hades. But how did the brothers survive? Turns out that Poseidon and Hades were never dead, they just grew older but Zeus freed them. Then what? Poseidon became ruler of the seas. Hades became the ruler of the underworld. And Zeus became the ruler of heaven and lived on top of Mount Olympus (the highest point in Greece). Zeus didn’t live alone - there were other gods there too, but he was the big chief of them all. The Greeks didn’t think about anything Zeus couldn’t do. He was able to do anything. 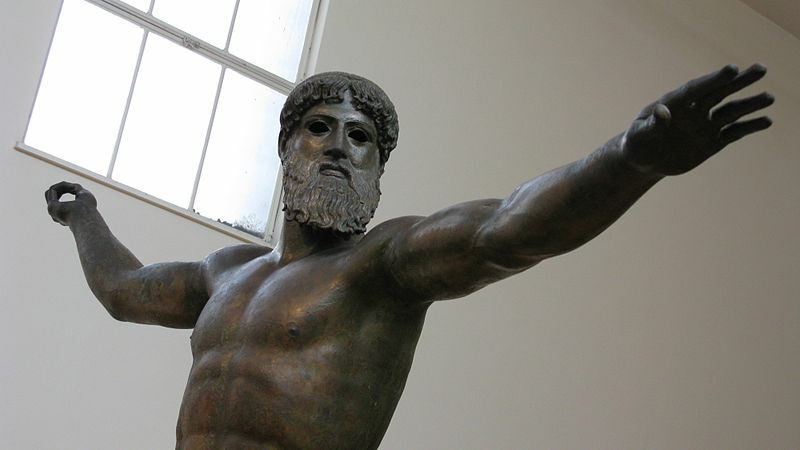 The Greeks built the statue of Zeus in order to honor their god. Some say the statue was built around 460 B.C. But that was not the only thing the Greeks made for their chief god. They also built a Temple in Athens (you can see the location here). Even though the statue was destroyed a long time ago, as well as the temple, you can still see that some things remain (both in Olympia and in Athens). In addition, the Ancient Olympic Games were originally held to honor the Greek god Zeus. If you would like to see more information about the statue of Zeus you can see this video. Dayanie O. Student "One of the Seven Wonders - Statue of Zeus by Dayanie Ortiz" AwesomeStories.com. May 19, 2017. Apr 18, 2019.